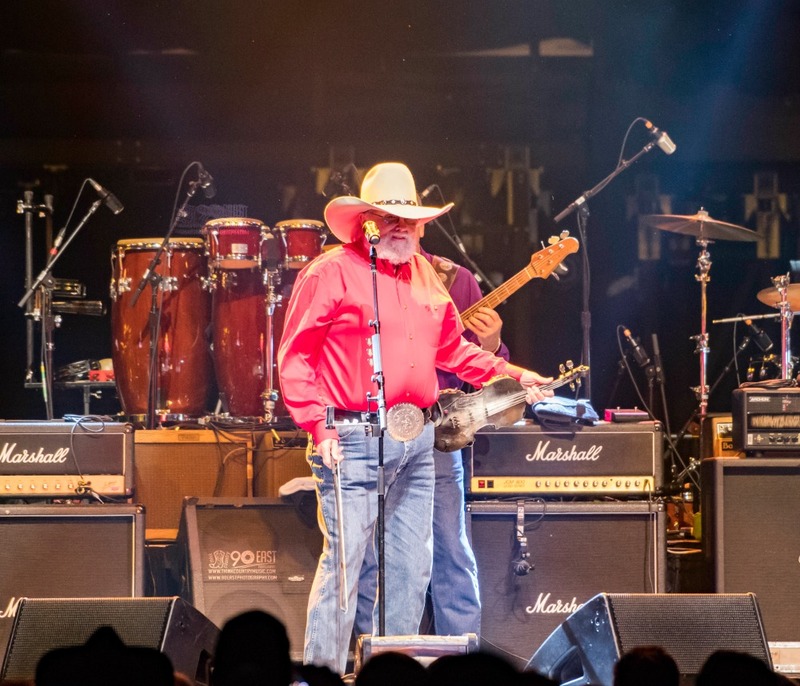 Not many people throw an 80th birthday party for themselves, but not many people are legendary country music star Charlie Daniels either, and not many people have seen a year quite as outstanding as he has to boot. Why not throw a birthday party for yourself and invite some of the best artists you know, and several thousand friends and fans along? 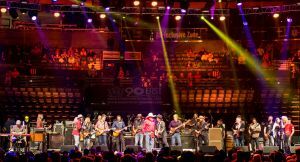 Sounds like a plan, and that plan was laid out and executed at Bridgestone Arena in Nashville at Volunteer Jam 2016, the 41st consecutive year Charlie Daniels has been holding this annual event. Upon entering the arena the one point that can’t be missed is, this is a party with a purpose. To raise money and awareness for our military and our veterans. Organizations such as The Journey Home Project and Wreaths Across America are championed by Charlie Daniels and a heavy presence was at Bridgestone at Volunteer Jam. 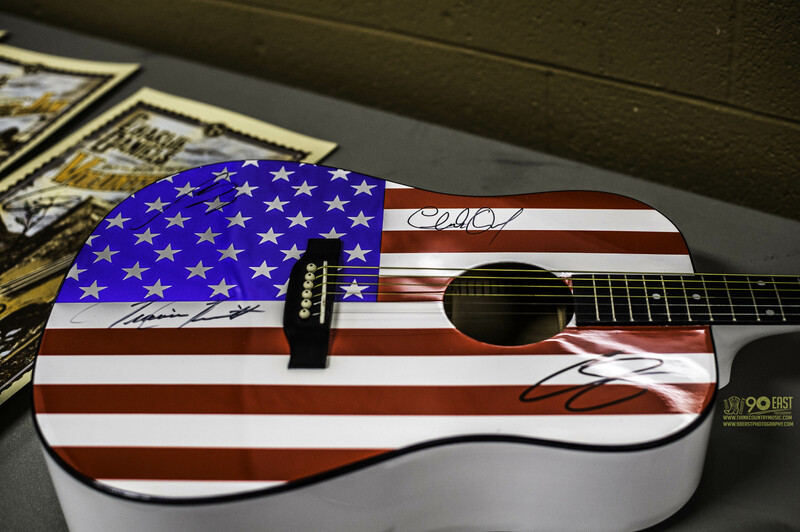 The patriotism never ends at the concourse at a Charlie Daniels show. 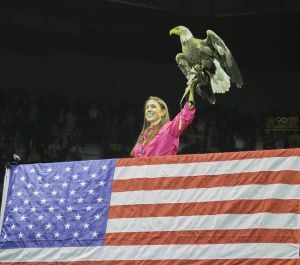 Following the singing of the National Anthem, a bald eagle, raised in captivity by the organization, eagles.org, was released from the stage to the back of the arena, to its handler. First up were rockers 3 Doors Down. Making a wise decision and sticking to radio favorites like “When I’m Gone”, “Here Without You”, and finishing strong with powerhit “Kryptonite”, there was little chance they were going to lose this mostly country music crowd early on. The songs were easily recognizable to just about everyone. They knew what they were doing and they did it well. Nailed it, in fact. This band is as strong as ever. They have deep ties to the Nashville area and they understand how things work here. Contrary to popular belief, it isn’t all country music and honky tonks here. It’s called Music City for a reason, because all genres are represented, including rock and roll. 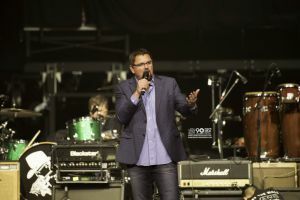 Lead singer, Brad Arnold, did not miss his opportunity to mention how honored the band was to play this event. The Charlie Daniels Band was always a bit of a crossover between country and rock, and I think it was never more apparent than last night. Sirius/XM The Highway’s, Storme Warren came out briefly to welcome the next guest and to share the fact that this year’s Volunteer Jam was Bridgestone Arena’s 4th largest attended event ever, which says a lot, considering how many events are held there each year. 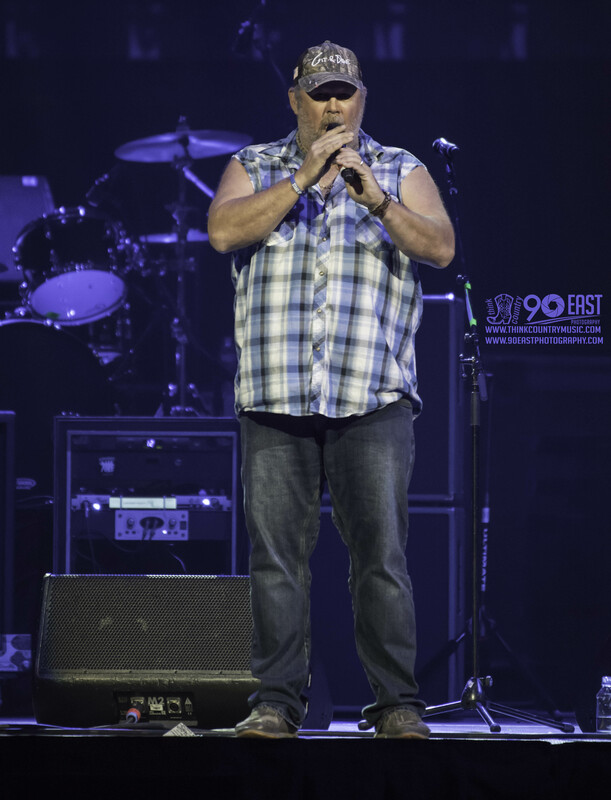 Larry the Cable Guy, the “Git-R-Done” comedian, was up next. His jokes included ones about being married to a much younger woman. “The one bad thing about being married to someone younger than you?” “Nothing.” He mentioned he’s working with fellow comedian Jeff Foxworthy, who he’s known for many years. He commented that Foxworthy once told a joke about Chick-Fil-A, and ended up receiving a Lifetime Chick-Fil-A Gift Card in the mail. Using that as inspiration, Larry told a joke about Arby’s at one of his own shows. Excited when he received an envelope from Arby’s in the mail, his hopes were quickly dashed, when after opening it, all that he found was a $20.00 gift certificate. You can’t blame a guy for trying. Lastly, our favorite cable guy had some big news. He will once again be voicing the part of tow truck, “Mater” in Disney/Pixar’s “Cars 3”. Look for it in theaters in June of 2017. If Charlie Daniels is an 80 year old living legend, his next guest artist is pretty legendary himself, if not near that number yet, and based on everything I’ve researched so far in writing this review, his fanbase is a formidable ARMY, that I would put up against almost any other country music fan group going. 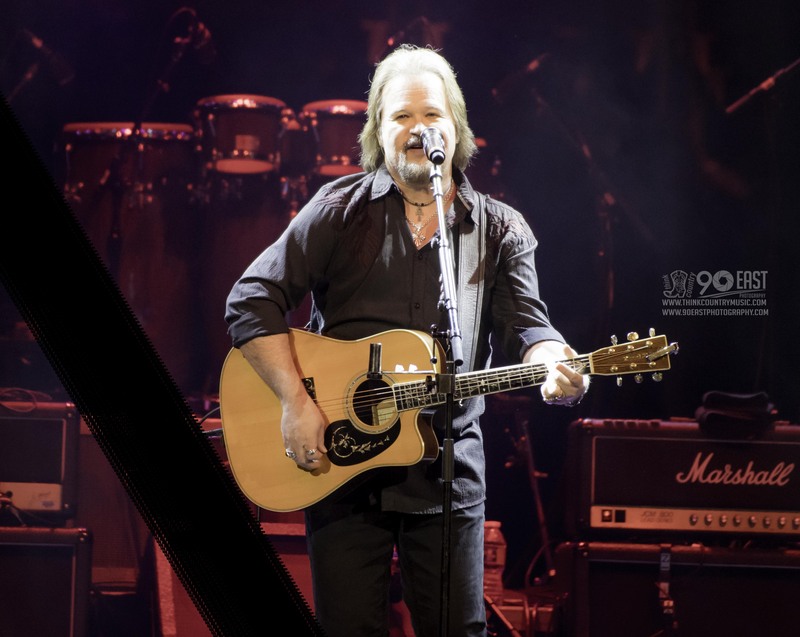 Mr. Travis Tritt took the stage, and the powers-that-be operating the Jumbotron didn’t waste a minute to zoom in on women, young and old, swaying and swooning to him singing “I’m Gonna Be Somebody”. It’s fairly easy to assume that this could have become a Travis Tritt concert all by itself, with the whopping number of hits the man has, so narrowing it down to a few songs may have been a chore, but “Here’s a Quarter (Call Someone Who Cares)” was one that we’re all thankful wasn’t left out. It seems everyone knows this song. 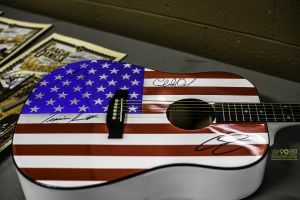 Maybe because it’s one of those anthems we’ve all needed at one time or another – a song that our country fan cousin told us about, even if we never listened to a country song in our lives. “He dumped you? Here. 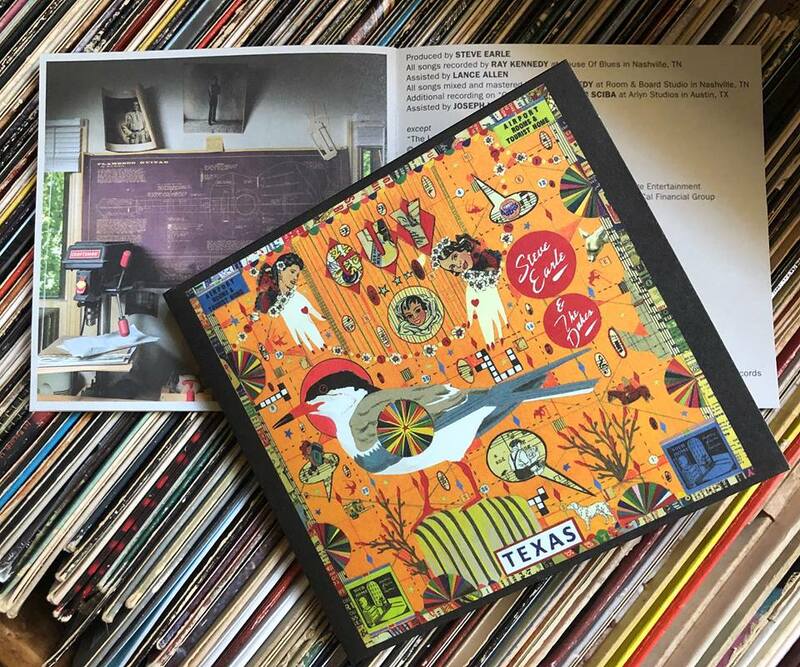 Listen to this.” Whatever the case, the song resonates, and it resonated last night as much as it ever has. That crowd was singing along and loving every minute of it. Tritt finished off his set with a rousing version of “Modern Day Bonnie and Clyde”, heavy on dobro and “It’s a Great Day To Be Alive”, perhaps one of the most uplifting songs in country music, or any music, for that matter. With everyone singing along, and perhaps knowing that this was Volunteer Jam, and their hero, Travis Tritt would almost definitely be coming back out, it WAS a great day to be alive indeed. Ever controversial, but always a patriot, Detroit-to-LA-to-Nashville’s Kid Rock came ready to show why he’s everyone’s favorite bad boy. Before breaking into a two song set, including 2007’s hit, “All Summer Long”, he gave a brief synopsis of how he ended up in Music City, part of which included his son’s graduation from Belmont University. Now we’re all clear that even so-called bad boys can move mountains for their kids, or at least move themselves. No matter what public opinion may be, he was a big draw at this year’s show, and people loved him. I was told that one of the questions asked of him at the pre-show press conference was, “What made you want to do this show?” His answer (and I almost feel sorry for the person who asked the question) was, and with a bit of an “Are you seriously asking me this?” look upon his face, was, “It’s CHARLIE DANIELS! Why WOULDN’T I do this?” This man is passionate about music, his country, the military and our veterans. Make no mistake, he got that point across, and I suppose he probably always does. Do we still need to relegate Chris Stapleton to the title, “Newcomer”? You would think not, but yet, many do. His songs have been flying around for a long time now, but as a performer and a headliner, I guess he may be relatively new to the masses, and in the lineup last night, he actually was the newest, so we’ll allow it this time. While we’re at it, we’ll also allow the fact that he might possibly have been the one to have sold a great majority of the tickets to the event. His debut studio album, “Traveller”, took the 2016 Grammy for Best Country Album and knocked the country music world off its axis. Many wanted it, nobody expected it. Not only that, but it signaled the turn around for country music in general. A return, if you will, to a more “traditional” country sound. Something more pure, more bluesy. If he could do it, could others? While others are working on it, it’s pretty apparent that he’s got it figured out. The crowd was completely on their feet for “Outlaw State of Mind”. The strength in this man’s hands when he plays guitar are truly a marvel to watch. “Whiskey and You” isn’t just another power ballad, doomed to end up in the “Country Love Songs” category of some country trivia game – it’s serious. It’s biting, and when witnessed live, it’s almost voyeuristic. 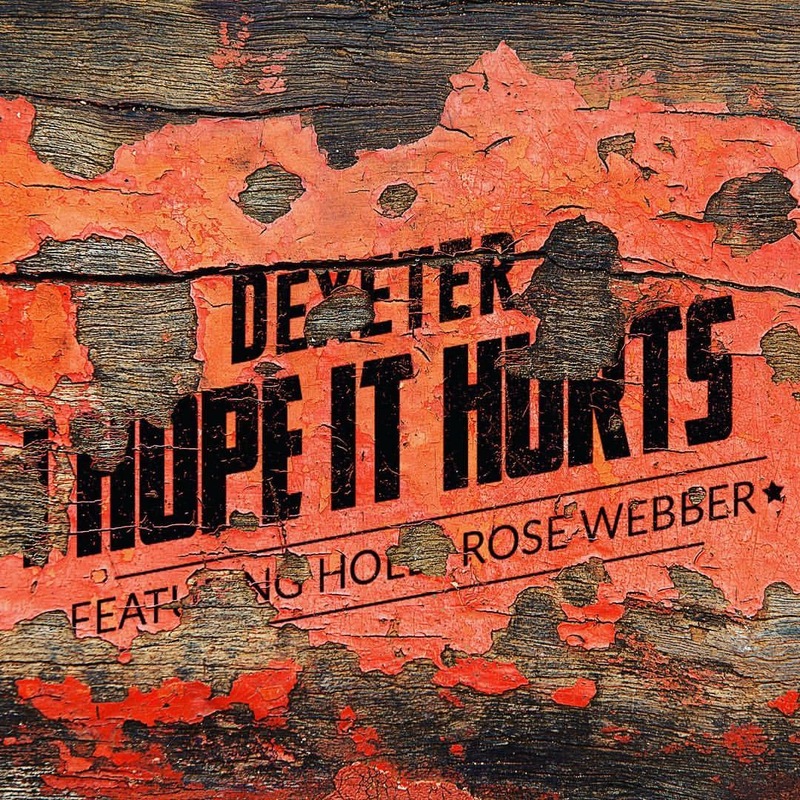 This song pulls a restless crowd into their seats like a vacuum and cuts deep. Nobody wants to be this guy. Ever. I’ve got nothing else to say about this one. Go see him play it live yourself. Ask any cover band what their pet peeves are, and you’re sure to hear this one, “Play ‘Free Bird’!” Of course, we all know that “Free Bird” is a beloved classic by southern rock band, Lynynd Skynyrd, and while it truly is a great song, it’s no secret it’s more than a little bit overplayed. 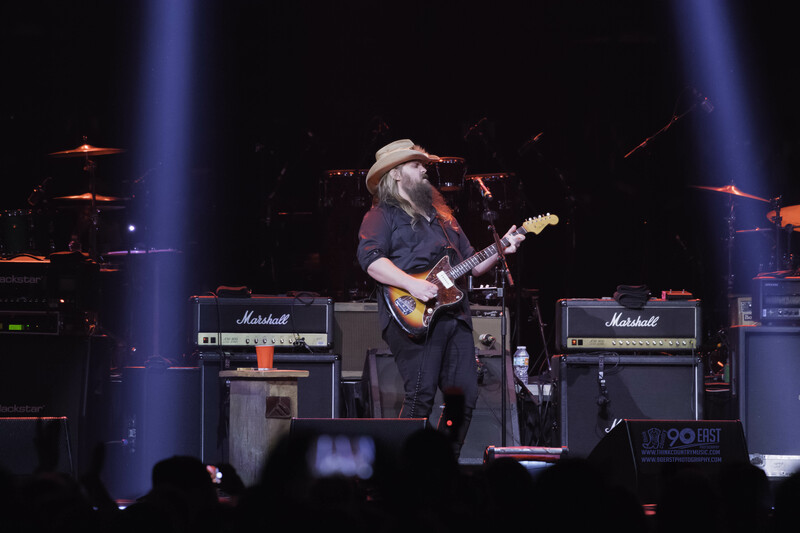 That being said, not many cover bands will even dare to play it, especially in Nashville, for fear of being laughed right off the stage (unless, of course, the tip is right), but when you’re Chris Stapleton, you do things your way, and guess what? You not only get away with it, people ADORE you for it. 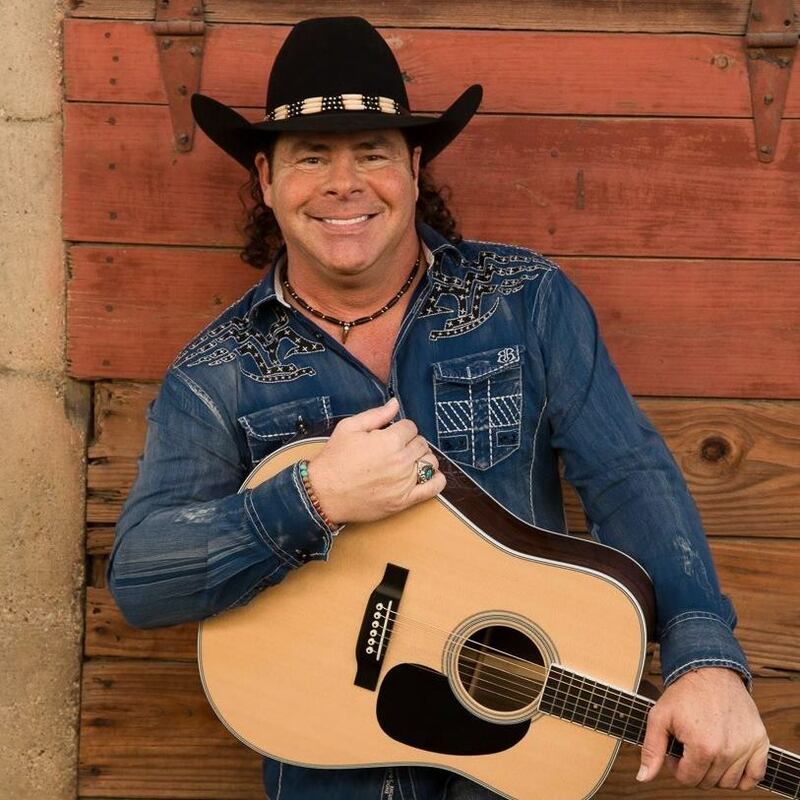 He took the liberty of tweaking his last original song by opening it with the beginning of “Free Bird”, and in the paraphrased words of the late, great Ronnie Van Zant, “played it pretty” for Nashville. He seamlessly took it from there right into his own, “The Devil Named Music”. It was quite an ending, and as with all the artists before him, it wasn’t really the end anyway. It’s never the end until Charlie says it’s the end. Up until this point, we’d had rockers, bad boys, legends, newcomers, it was time to shake things up. Of course, by this I mean, Luke Bryan. 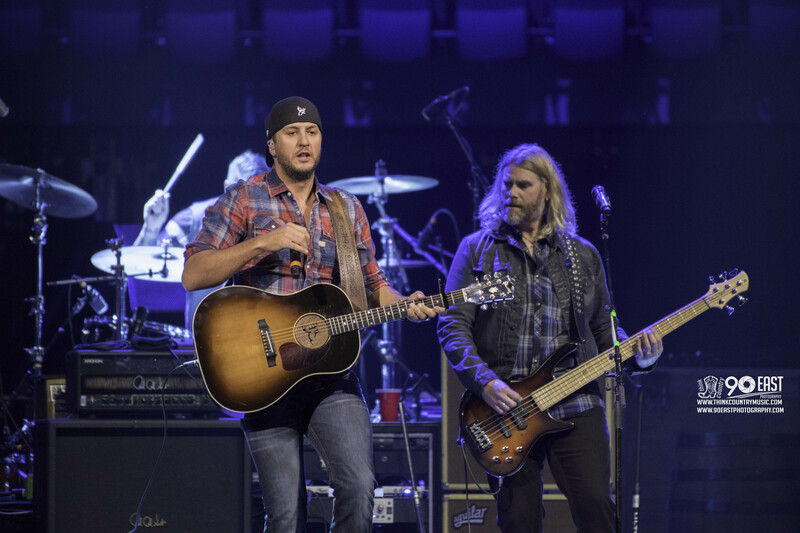 Everyone knows when it comes to shaking one’s moneymaker, nobody in country music shakes it better, or more often, than Luke, and he wasn’t off his game one bit. Getting it going right off the bat with 2009’s upbeat “Rain Is A Good Thing”. Bryan had the crowd singing and dancing in the aisles. He slowed it down considerably with “Play It Again”, but it didn’t stop the sing-a-long, that’s for sure. Luke Bryan, an avid outdoorsman, made reference to a record whitetail that was recently shot in Tennessee, which was the perfect opening to his next song, the recent radio hit, “Huntin’, Fishin’, and Lovin’ Every Day”. Being that this audience was largely made up of other hunters, the song, and the whitetail remark wasn’t lost on many. Luke knows his audience, as does Charlie Daniels. Completing his turn at bat, Bryan finished strong with the fast-paced, “Move”. His fans are diehards. When he dances, they dance. When he sings, they sing. When he shakes it, they shake it. Or, they stop dead in their tracks – and stare. This number created a mix of all of these. After the next break, the big moment finally arrived, the guest of honor was ready to play, but first a pumped in “Tennessee Waltz” played to a darkened arena while things were being set up. In typical Charlie Daniels fashion, he didn’t just jump in and take over just because it was his turn. Once again, even though he brought out his band, he also brought out Travis Tritt too. Together, they played a crazy good version of “Southern Boy”. There’s simply no way to leave out the fact that, even at the age of 80, Charlie Daniels has still got the dexterity and musicality of musicians far younger. He has lost nothing. It is incredible to watch him play and you can almost feel the emotion in his playing. This man loves what he does, and he loves sharing it. He knows he’s fortunate to have lived and worked this long doing what he enjoys. There’s not many in this business that have had that kind of luck. Oh, but the next song always does the trick. It never fails to chill you, haunt you, eat you up and spit you right back out and leave you to lie there, just waiting to do it all over again the next time. “Legend of the Wooley Swamp” is one that Charlie Daniels delivers as only he can. He KNOWS old Lucius Clay and how he operates. Don’t let anyone else tell you that story, because they might not get the details just right. Once again, he told that old ghost story to a few thousand of his closest friends, around a “campfire” that looked a little more like some footlights, but nobody was really paying attention to the lights anyway, they were watching Charlie’s eyes, and listening to him singing those lyrics. You got ’em again Charlie. They won’t be goin’ out to the Wooley Swamp, especially not at night. It wouldn’t be a Vounteer Jam if it didn’t include these two classic Charlie Daniels Band songs, “What This World Needs Is a Few More Rednecks” and “In America”. It also wouldn’t be a Volunteer Jam if Charlie didn’t preface them by letting people know how passionately he believed in these songs. First by telling those on Twitter that call him a “redneck” or a “hillbilly” that he thanks them for that, and that he dedicates “In America” to ALL military, past, present, and future. It’s been said that Charlie Daniels is a very good man to work for and that he respects and appreciates his band members quite a bit. Nowhere is this more obvious in the song, “Black Ice”, which was performed next. This number was specifically written to showcase each individual band member’s talents. 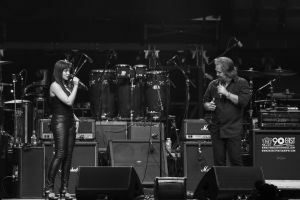 It’s always a showstopper, especially for true music lovers, and it was in some special sort of overdrive for Charlie’s 80th birthday bash. Daniels slowed it down, with the rebel anthem, “Long Haired Country Boy”. Still relevant after all these years, because when you know who you are, and you’re firm in your thinking, not much changes. That is Charlie Daniels, and for much of his fanbase, it’s the same. They stick with him because of that, and that’s why they sing along so loudly and with such conviction. They believe him because he IS believable. Not because he’s some corporate label’s idea of what he should be, he just IS. 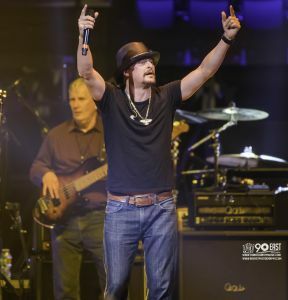 Speaking of people who are what they are, out on stage comes Kid Rock, with some lyrics specially written for Charlie Daniels. Well, there was just one point, where Charlie had to remind him that he couldn’t say THAT, as “This is a country show”, but it was followed by a friendly hug, and off he went, while Charlie Daniels finished his set before bringing out all the evening’s artists to finish off the festivities. Nashville, Tennessee. Music City, USA. Where magic happens every single day. From writers’ rooms on Music Row to honky tonks on Broadway and every nook and cranny from apartments in the suburbs to places we can’t even talk about here. That’s Nashville. The common denominator is The South. The South has brought us some of the greatest musicians that have ever lived. Memphis, New Orleans, Atlanta, Dallas, Austin… small towns all over the south. That’s where Charlie Daniels and his band chose to wrap this 80th birthday party up, and what a beginning to an end it was! Bring them all out. Bring them all out to sing the most appropriate song to salute a region that not only has created the best music, but some of the hardest workers, the most down to earth, REAL people this country has ever known – “The South’s Gonna Do It Again”. 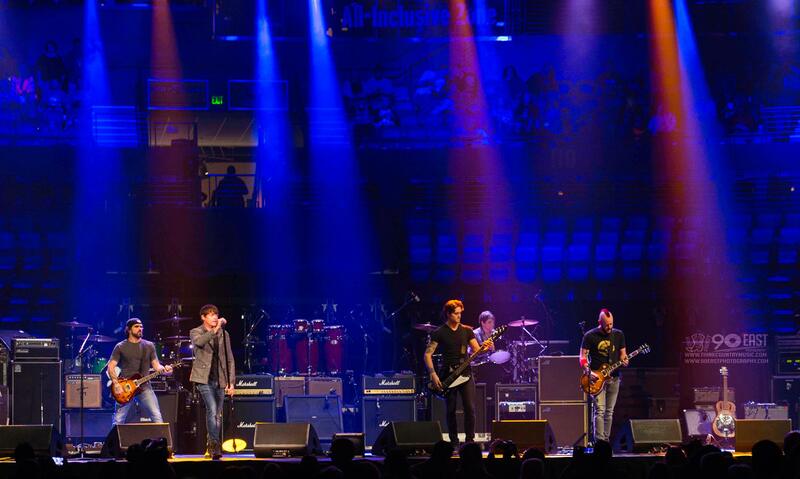 It was a real celebration on stage at Bridgestone Arena. 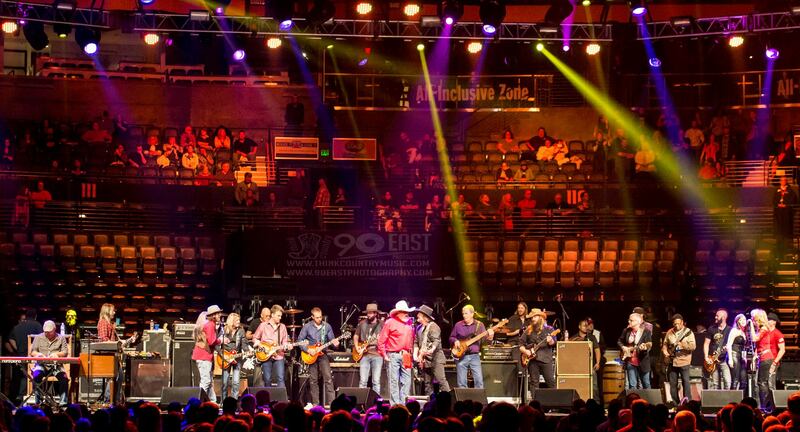 As if that wasn’t enough, how do you surprise a man like Charlie Daniels on his 80th birthday? Hasn’t he been surprised by just about everything after all these years? Well, maybe not. He was finally inducted into the Country Music Hall of Fame this past year, so that was already out. How about bringing Randy Travis out on stage? Yes. That might do it. Yes. That absolutely did it. He was really surprised, and it was one of the great moments that made you glad you were there to witness it. Not to take a touching moment and let it stop the momentum for long, Luke Bryan then joined Charlie Daniels by singing “The Devil Went Down to Georgia” with him. This was certainly different, but really appropriate, as Luke does hail from Georgia, so, why not? It was fast, fun and, as always, nobody plays the fiddle like Mr. Daniels. Nobody. Two beards, two guitars. “Was It 26” was performed by Charlie Daniels and Chris Stapleton. It was hauntingly beautiful and it could have went on forever as far as I was concerned. A group cover of The Marshall Tucker Band’s “Can’t You See” was simply incredible. A familiar tune. 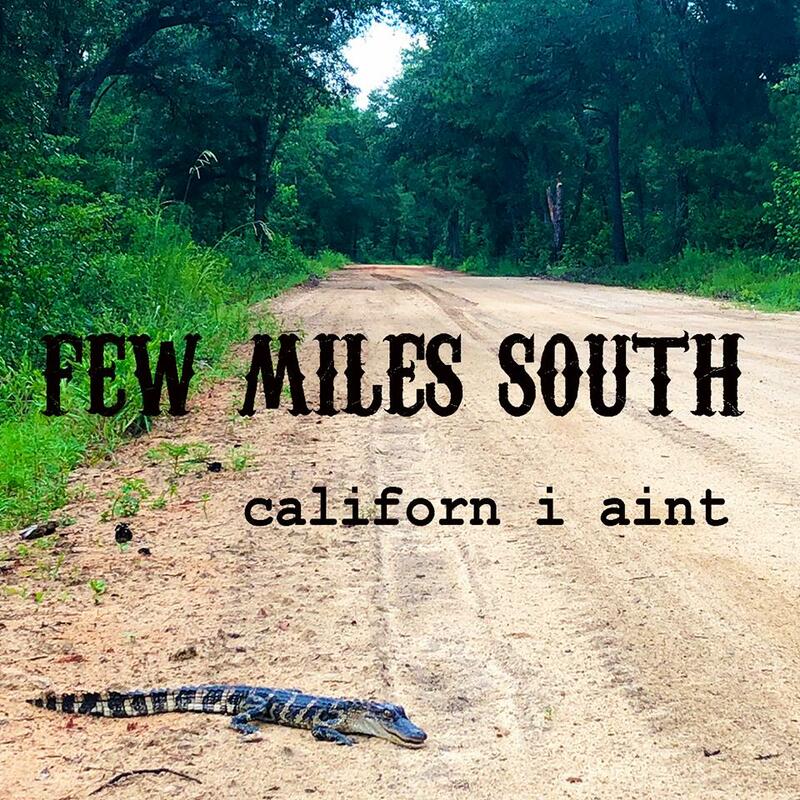 A southern rock tune. 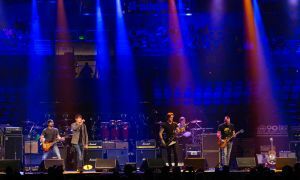 Southern rock, which is a great blending of country and rock, which pretty much summed up the evening and its artists. Country and rock have usually played well together, and boy did they play well together at this birthday party to end all birthday parties. Thank you, Charlie Daniels, for inviting us.